South of France? No, Cahuenga and Highland! Once, long before the Hollywood Freeway obliterated everything in its concrete wake, there sat at the mouth of the Cahuenga Pass an enchanting little group of bungalows and artist’s studios known as the French Village. 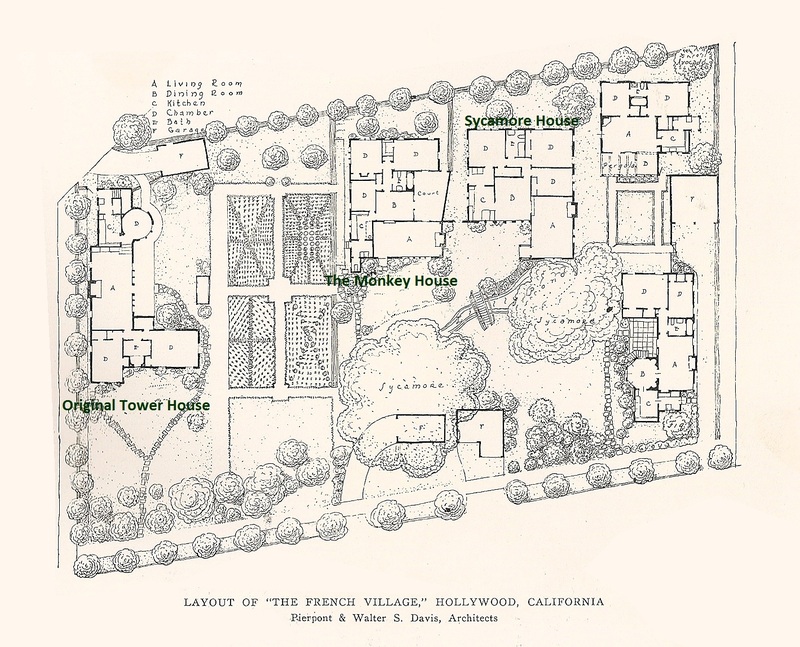 The French Village was the work of the extremely talented Walter S. and F. Pierpont Davis, sibling architects who, during their all too brief partnership, designed some of Hollywood and Los Angeles’ most beautiful and romantic structures. Although their oeuvre included homes, commercial properties and even churches, the Davis brothers’ are perhaps best admired for a set of deluxe apartment courts they designed in the 1920’s, most notably the Roman Gardens at 2000 North Highland Avenue (1926) and the Court of the Fountains (today known as Villa D’Este) at 1355 North Laurel Avenue in West Hollywood (1928). 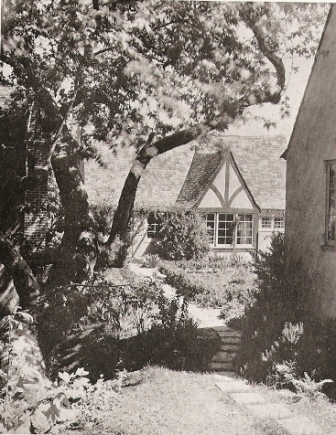 Originally, the French Village consisted of five picturesque cottages designed by the brothers and partner Henry F. Withey, and sited on a triangular plot of land at the point where Highland Avenue and Cahuenga Boulevard converged as they entered the Cahuenga Pass. Exuberantly French Provincial in style, the cottages featured steeply pitched slate roofs, rough plaster walls and tall exposed brick chimneys. These common attributes aside, each of the cottages were completely unique in design and personality. At least three of the houses were given separate names such as the Tower House, the Sycamore House and the Monkey House, the latter after the elaborate and whimsical bas-relief carving of a group of monkeys cavorting over the home’s entrance. 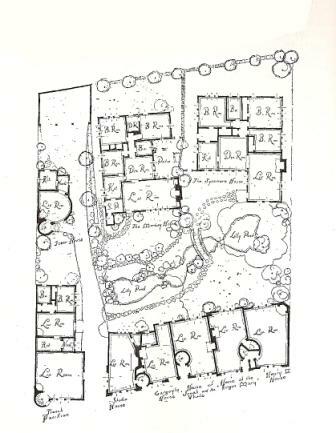 The surrounding gardens, which were later described as “the core of the little community,” were arranged with as much care as the cottages themselves. Flagstone pathways meandered their way through the sycamore shaded grounds, around gardens filled with hollyhocks, California poppies and banana palms, and over a rustic bridge, which surmounted an elongated lily pond. All of the cottages were oriented to take as much advantage of the garden vistas as possible. To keep modern Hollywood from intruding into this little bit of France, a series of shade trees were planted along all sides of the property, screening it not only from the increasingly busy streets on either side, but the decidedly unpicturesque gas station located at the very tip of the property. 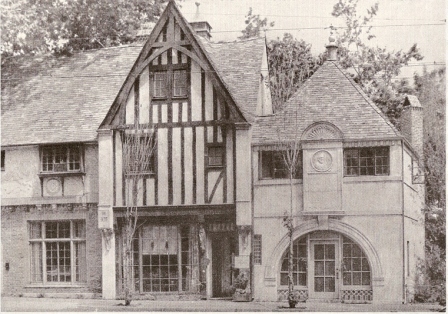 Completed in 1920, the French Village was immediately hailed for its charm and uniqueness with the Brothers and Withey receiving a citation of achievement from the local chapter of the AIA. 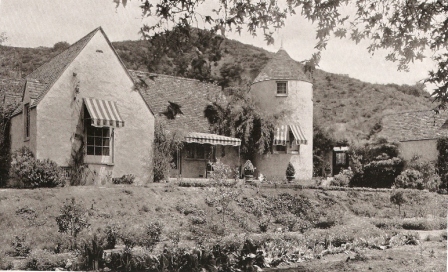 Unlike most earlier bungalow courts, the French Village was intended for the transitory well-to-do and its construction helped to usher in a vogue for ever more elaborate apartment courts in Hollywood that would last the remainder of the decade with the Davis brothers and Arthur & Nina Zwebell as their master designers. New York’s famed Pen & Brush Club. Mrs. Muchmore was to become something of a den mother to the quaint little community during its heyday in the 1920’s and the first of a series of artists to flock to the village. 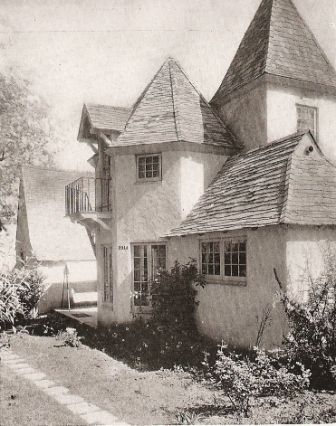 In 1923, Wallace Beery became Minnie Muchmore’s next door neighbor when he rented the Sycamore House. Not yet the “lovable ole cuss” he was to become at MGM in the 1930’s, Beery was nonetheless at the time of his residence at the French Village a highly regarded character actor renowned for playing everything from King Richard the Lion-Hearted in Douglas Fairbank’s Robin Hood in 1922 to the caveman villain in Buster Keaton’s The Three Ages (1923). 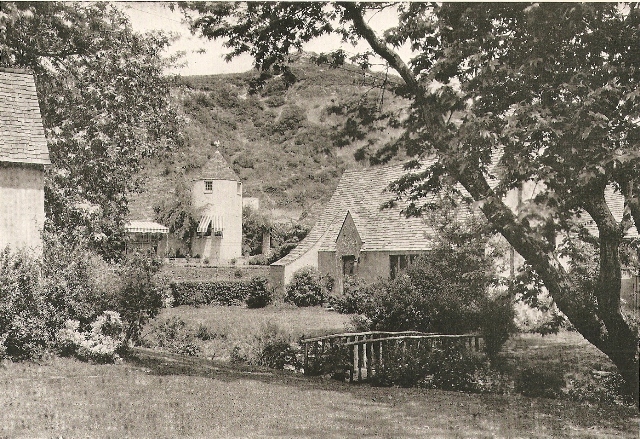 Beery must have chosen the French Village not only for its close proximity to Famous Players-Lasky where he was under contract at the time, but also to nearby Holly Springs Heights where he was building an impressive hillside home on Pilgrimage Trail that was soon to be dubbed “The Villa of the Villain” upon its completion in 1924.
demolition of the beautiful Tower House. Rather than disaster, however, the Davis brothers saw the Five Finger plan as an opportunity to actually enlarge the Village and adapt it to the growing needs of Hollywood. In doing so they scored a major architectural achievement. The New French Village. 1925.
de force of classical French architecture at its most beguiling and picturesque. Gargoyles, heavy timbers, tapestry brick work, bas-relief sculptures, balconies and towers, these and many more decorative elements were woven into the design of the artist studios, which were each given names as whimsical as their designs such as the Gargoyle House, the French Pavilion, the Studio House, the House of the Virgin Mary and the House of Jonah and the Whale. the cream-colored plaster walls and placing his drafting table near the beautiful arched front window. Rare books on architecture and landscape design were piled upon an ornate Renaissance table, while plum-colored draperies framed the garden vistas visible from the rear windows of the charming space. A winding staircase led to a colorfully painted kitchen and a bedroom with a steeply pitched ceiling. 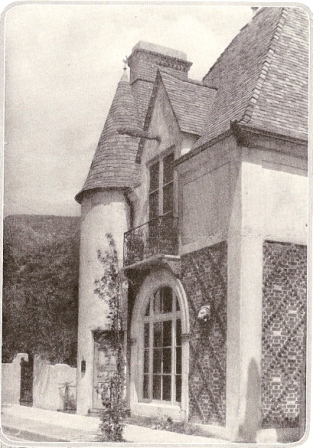 The charming French Pavilion with its elaborate tapestry brickwork, candle snuffer tower entrance and wrought iron balcony, had originally been home to Gilbert Adrian before he switched over to the adjacent Tower House. 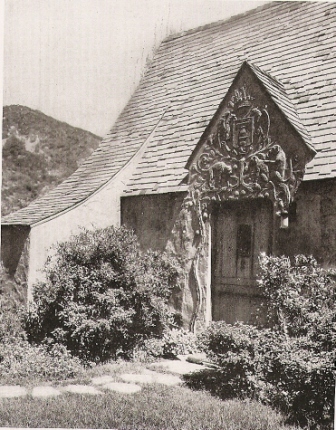 By 1930, the French Pavilion had been taken over by writer Cyril Hume and his wife, actress Helen Chandler. Both were to achieve notable successes while living at the French Village, Hume as the screenwriter for Tarzan of the Apes for MGM and Chandler as “Mina,” the object of Bela Lugosi’s unholy desires in Dracula (1931), which was filmed just up the Pass at Universal. Throughout the 1930’s and 1940’s, the French Village continued to serve the artistic community with a steady roster of actors, writers, costume designers, dance instructors and singing coaches in residence. Music and song often wafted out from the open casement windows into the lush courtyard or out into the street. These melodic sounds, however, were getting drowned out more and more by the endlessly increasing traffic zipping, or all the more frequently, crawling up and down the Cahuenga Pass. Progress was both inevitable and unstoppable and the construction of the Hollywood Freeway at the beginning of the fifties was the death knell for the enchanting little court. By 1952, all trace of the French Village had vanished and today it remains only as a dim memory, but a sweet memory it is. This entry was posted in Central Hollywood, Lost Hollywood and tagged Apartments, Cahuenga Boulevard, Cahuenga Pass, Cyril Hume, F. Pierpont Davis, Gilbert Adrian, Helen Chandler, Henry F. Withey, Highland Avenue, Minnie Muchmore, Wallace Beery, Walter S. Davis. Bookmark the permalink. Thank you SO much, Rikki! Really appreciate that. The Davis brothers were such exceptional artists, its a tragedy that any of their work has been demolished, but fortunately we still have some left, at least for now! I loved the article on the French Village. I am president of Hollywood Heritage and our museum is just south of the village. 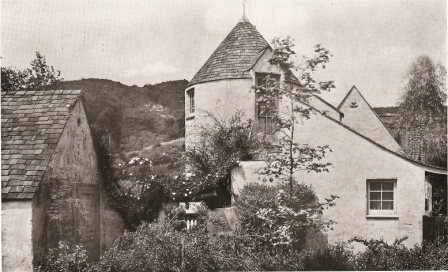 I am also writing a book on Adrian and have never found a picture of the new Tower House. How did you find out he was at the French Pavillion before the Tower house? He had only arrived in Hollywood in October of 1924 and it was my understanding that Natacha Rambova found him a place to live. He moved to Villa Vallambrosa in 1931 with his mother after his father died. His parents had moved from Connecticut to a little house on Flores Ave. in West Hollywood. He then bought a house in Toluca Lake from Billie Dove in 1934, where he lived when married to Janet Gaynor until 1943 when they moved to Encino, then on to Bel-Air and finally an apartment on Melrose Place, where he died. Your website has a type, it’s H.J. Whitley, the founder of Whitley Heights. Terrific research! FYI – another Walter S. Davis house, designed for his son, Carlo P. Davis, will be going on the market in the next six months or so…..located on the Palos Verdes Peninsula it has a number of unique architectural elements that are typical of Davis buildings: fabulous fireplaces, a round living room, domed ceiling, lovely courtyard style entrance with a beautiful fountain. This home also includes five fabulous Roman style mosaics done by his son, as well as a carved Islamic door and bronze entrance that consists of a series of panels dipicting moments of his life. It is an amazing complex, isn’t it? One of Hollywood’s greatest and as long as it is still standing there’s a chance it will get a restoration. As it is, it’s not too bad. I toured a couple of apartments there a few years ago. Beautiful spaces. One little single unit had an original 1926 mural painted on its wall. It was beautiful and a miracle to have not been painted over after all these decades. The most famous resident I ever found there was a good one – Joe Mankiewicz lived there in 1931, years before ALL ABOUT EVE. It’s a fabulous building but…the parking situation. Oh I have another question: When touring Whitley Heights for the first time I was at the the edge of the hill where you look down on to Hwy 10. I am aware that is what used to be WH and many houses were razed for the construction. What is directly on the other side of 101 now? did it used to be part of Whitley Heights before the freeway? FASCINATING, EVERYTHING HOLLYWOOD! THANKS FOR EVERYTHING! GHOSTS DO EXIST! I’m working with the owners to try to find a new home for the Moorish looking ceiling in the bedroom (about 3 mins in on the video), which was done by Davis’ son in the 60’s and 70’s. I tried to convince them to keep it there, but they are removing it. Hopefully we can find a new location to preserve it in. Great hearing from you! Yes, I am familiar with that wonderful house and I am sorry the ceiling is being taken away but hopefully it will find a new location. It is simply stunning. Although it is obviously not for everyone. I’m glad that it’s you helping to find it a new home as I know you’ll be successful. Maybe someone seeing this will be the one. Thanks so much and will you please keep me posted on what becomes of the ceiling? I’d love to know. I heard from the owner a while ago that they found a homeowner who was thrilled to take it out and reinstall it in their own house up in Santa Barbara. Sad that it left this area, but very happy that it has been preserved. Anybody interested in ‘Twenties theme buildings should check out the Granada Buildings at 672 S. La Fayette Park Place, just south of Wilshire Blvd. Four buildings in compound were designed to evoke a Spanish village and built to provide living/working quarters for artists, artisans, couturiers and designers catering to film stars and the wealthy elite in surrounding Wilshire neighborhood. Grounds feature a central patio with trees and fountains, and a large outdoor fireplace for casual gatherings to promote an art colony experience. 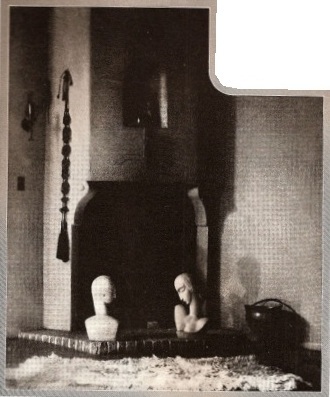 Famous residents included glamor photography pioneer George Hurrell and Man Ray. Hello, we just bought our neighbors house as we were afraid flippers would tear it down. 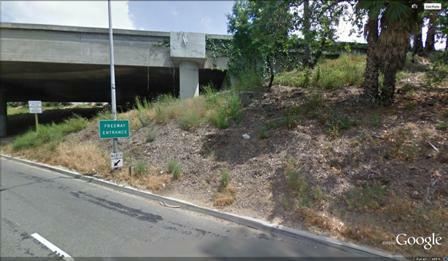 Paperwork shows it was built in 1920s by the Davis brothers and was moved here in 1951 (I assume for the HW freeway. It’s been barely touched, has a crest imbedded on one gable (For fame and family), low sloping high pitched roof, ogtaginal dining room, original wavy glass in most French windows. From research, it looks like it came from the original French Village (see lower RH corner on layout plan). However, the kitchen and back porch look smaller. Original garage was also moved here. We are in love with it and we are grateful for all the information in this article. That is incredible news! I have tried to find the house as I noted it was being moved to a new location but the address I had didn’t seem right. Now I know you wouldn’t want to give out the address (and I don’t blame you) but I would be so thrilled to see where it wound up. It’s such a fascinating history! If you had a photo of the house, could you e-mail it to me at paradiseleasedblog@yahoo.com? You’d make me very happy and I know the people at Hollywood Heritage would be thrilled too since that’s about where the house was now. Thanks for writing. It made my day! Will do Steve. I took a video with my phone. I was blown away when I saw the same floor plan on the internet of the French Village. I, for one, would love to see this wonderful house that you purchased and most likely kept from being demolished. Ever since I read online about the lovely French Village that once existed in the Hollywood area, I hoped some small part of it might still be around. Is the house still located in the general area of Hollywood? Thanks for letting us know about it.